Jennifer Kilbury, Bright Star Award recipient, is pictured with, (l. to r.) Sheila Ehrhardt, Huron Chamber director, Vicky Hawke, NOACC executive director and Tony Gallo, NOACC chairman. The Northern Ohio Area Chambers of Commerce (NOACC) recently honored deserving members of its 120 Chambers, located across northern Ohio.Jennifer Kilbury, a member of the Huron Chamber of Commerce, is the recipient of this year’s Bright Star award. NOACC and its member Chambers recognize the invaluable assistance that volunteers provide to these organizations year in and year out. The recipients were showcased recently at a dinner meeting at the Great Lakes Science Center in downtown Cleveland. The old adage of “when you need something done, count on a busy person to do it,” certainly holds true for this year’s Huron Chamber honoree. A wife, mother and owner of Cottage Designs graphic arts business, Jennifer Kilbury still makes time to work on projects for the Huron Chamber throughout the year. The and Chamber director Sheila Ehrhardt collaborated to create a colorful collage of Huron photos that have proven to be a very popular souvenir and memorabilia item that the Chamber is using as a fundraiser. “Although originally from Bainbridge, Ohio, Jennifer is passionate about her adopted community and has pitched in to help on projects way too numerous to mention,” Ehrhardt explained. President of the Huron River Fest committee, a member of the Huron Joint Recreation Board and the Huron Education Foundation, Jennifer also served as co-chairman of the city’s Bicentennial “Artirondack” community art project in 2009. She is a volunteer for Water Safety Day, a hands-on program for all students in 3rd & 4th grades, and provides stories and photos about Huron school activities to area media. This energetic young woman still finds time to operate an advertising and marketing agency out of her home. She and her husband, Rodney, are the parents of Jack,14 and Maddie, 11. 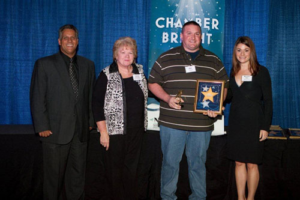 Chamber president Bruce Miller presents the 2011 Bright Star Award to Mike Wilde, owner of Domino’s Pizza. The Chamber of Commerce Bright Stars for 2011 were recognized on Thursday, October 27th at the semi-annual Chamber Leadership meeting and fourth annual Bright Star Awards presentation of the Northern Ohio Area Chambers of Commerce (NOACC) at the Hyatt Regency Cleveland at the Arcade in Cleveland. 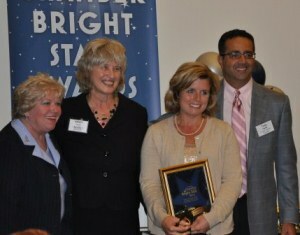 Mike Wilde, owner of Domino’s Pizza earned the Huron Chamber’s 2011 Bright Star award. Presenters this year were Wayne Lawrence, NOACC Chairman and Lute Harmon, chairman of Inside Business Magazine. Almost 50 Chambers of Commerce across northern Ohio nominated a member as a “Bright Star,” to recognize those who have “made a significant impact on the chamber through membership, retention, sponsorship, economic development, operations and/or education.” Each Bright Star is an active chamber member for no less than two years and is likely to be an unsung hero or a dedicated behind-the-scenes volunteer. Wilde is a soft touch. The owner of Domino’s Pizza in Huron, he is constantly sought out by every club, sports team and civic organization planning a fundraiser. He’s always willing to donate his pizzas – and lots of them — for just about any good cause. Throughout the l3-year history of the Huron Chamber’s annual Lighthouse 10-Mile and 5K races, Mike not only donates more than a dozen pies for the ravenous runners, but is up at the crack of dawn on race day — after closing the store very late on a Friday night, coming in to bake them himself. A modest man, Mike himself has never told anyone this anecdote about his longtime friendship with Mike Danilo, a family man in the prime of his life who succumbed to the dreaded Lou Gehrig’s disease earlier this year. After his death, the family wrote to Domino’s corporate offices thanking them for Mike’s generosity in treating the entire family to pizza every week of their two-year ordeal. A former member of the Chamber’s Board of Directors, he continues to be a promoter of the value of Chamber membership. 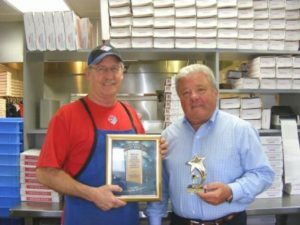 Wilde and his brother, Skip, partners in the Huron and Norwalk locations, operate stores that consistently earn a five-star rating, the highest recognition in the Domino’s chain. Volunteers such as Wilde represent a wide range of involvement with their respective chambers, some having been a member and or officer or committee chairman for 20-plus years and some being newly involved, but each of whom has given freely of his/her time, working hard for their chambers without any expectations. “We are pleased to have this opportunity for our Chamber and our community to give Mike the thanks he deserve for everything he does to help our Chamber succeed,” said director Sheila Ehrhardt. Matt Cummings is presented the NOACC Bright Star award by TV-3 news reporter Maureen Kyle. Looking on are NOACC chairman Wayne Lawrence and Chamber director Sheila Ehrhardt. The Northern Ohio Area Chambers of Commerce (NOACC) is observing its 15th anniversary this year. The group is made up of 120 Chambers located in towns all across northern Ohio, representing some 30,000 members. “For these fifteen years, we’ve been fulfilling a mission to secure benefits to business owners that they would not be able to get on their own. It’s an invaluable resource,” said Vicky Hawke, NOACC’s executive director, speaking at the semi-annual Board of Trustees meeting last month at Cleveland Metroparks Zoo. Chambers, like any progressive service organization, could not function without a great team of dedicated volunteers. “That can mean everything from event planning to recruiting and retention efforts, to chairing committee, and stuffing envelopes,” explained Wayne Lawrence, executive director of the Beachwood Chamber of Commerce and chairman of the NOACC board. “These volunteers help run the chambers, expecting nothing in return,” said Ms. Hawke, introducing the forty-six winners of Bright Star awards for 2010. Gorillas, snow leopards, and a couple of ring-tail monkeys peered out of the floor-to- ceiling glass panels of their habitats, just inches from the more than 150 guests enjoying dinner in the primate building. Presenting the awards was Maureen Kyle, an anchor and reporter at WKYC-TV3. Selected to receive one of this year’s NOACC Bright Star awards was Matt Cummings, Huron Chamber Vice President and two-term board member. A young man who worked his way through high school and several years of college while working part-time for Barb Leber at Pizza House West, he liked the business so much that in 1991 he became proprietor of the Huron Pizza House and the rest is history.Matt has become a vital member of the Huron business community, making generous donations for school activities throughout the year, hosting dinners at his Main Street pizzeria, with proceeds going to local families facing medical crises as well as numerous Huron Tiger fundraisers. He recently assumed the Vice Presidency on the Chamber board of directors. He lends his strong arms and spirit of cooperation to just about every Chamber project throughout the year. Dressed in his signature denim shorts and Pizza House t-shirt, whether it’s 90 degrees during the River Fest, or 20 degrees at the Festival of Lights at Sawmill, Matt is there to lend a hand. He chaired the Personalized Street Banner Program and has been my guy-to-go-to on numerous Chamber projects through the years. Congratulations, Matt.